The findings come off the back of a major announcement last week from Bloomberg Philanthropies which makes Bath's Tobacco Control Research Group one of the leaders of an all-new $20 million global tobacco industry watchdog aiming to counter the negative influences of the tobacco industry on public health. The global partnership aims in particular to highlight tobacco industry activity across low and middle income countries. The first study, which draws on leaked documents, highlights the elaborate lengths the industry has gone to control a global track and trace system and to undermine a major international agreement—the Illicit Trade Protocol—designed to stop the tobacco industry from smuggling tobacco. A linked blog and editorial in the BMJ, help explain the findings. In 2012, off the back of a string of inquiries, court cases and fines all aiming to hold the major tobacco companies to account for their involvement in global tobacco smuggling operations aimed to avoid paying taxes, governments around the world adopted the Illicit Trade Protocol (ITP). Part of a global treaty, the Framework Convention on Tobacco Control, the ITP aims to root out tobacco industry smuggling through an effective track and trace system—a system in which tobacco packs are marked so they can be tracked through their distribution route and, if found on the illicit market, can be traced back to see where they originated. Fearful of developments, the new study argues that at this point the tobacco industry claimed to have changed, no longer the perpetrators of smuggling, but instead themselves now the victims of smuggled and counterfeited tobacco. Simultaneously the major tobacco companies developed their own track and trace system, 'Codentify', lobbying governments around the world to see it adopted as the global track and trace system of choice. Leaked documents show the four major transnational tobacco companies hatched a joint plan to use front groups and third parties to promote 'Codentify' to governments and have them believe it was independent of industry and how these plans were operationalised. For example, the study reveals how a supposedly independent company fronted for British American Tobacco (BAT) in a tender for a track and trace system in Kenya. Yet, reveal the researchers, growing evidence suggests the tobacco industry is still facilitating tobacco smuggling. Approximately two thirds of smuggled cigarettes may still derive from industry. At best, the authors suggest, this shows the tobacco industry's failure to control its supply chain, but they point to growing evidence from government investigations, whistleblowers and leaked tobacco industry documents all suggesting ongoing industry involvement. The study suggests that in order to bolster support for their system and enhance their credibility, Big Tobacco created front groups, poured funding into organisations meant to hold it to account and into initiatives that would curry favour, and paid for misleading data and reports. Professor Anna Gilmore, Director of the Tobacco Control Research Group, explains: "This has to be one of the tobacco industry's greatest scams: not only is it still involved in tobacco smuggling, but big tobacco is positioning itself to control the very system governments around the world have designed to stop it from doing so. The industry's elaborate and underhand effort involves front groups, third parties, fake news and payments to the regulatory authorities meant to hold them to account." The second study, published today examines the quality of the data and reports on illicit tobacco that the tobacco industry has funded and raises further concerns about the tobacco industry's conduct. It finds that industry-funded data routinely overestimates levels of tobacco smuggling. 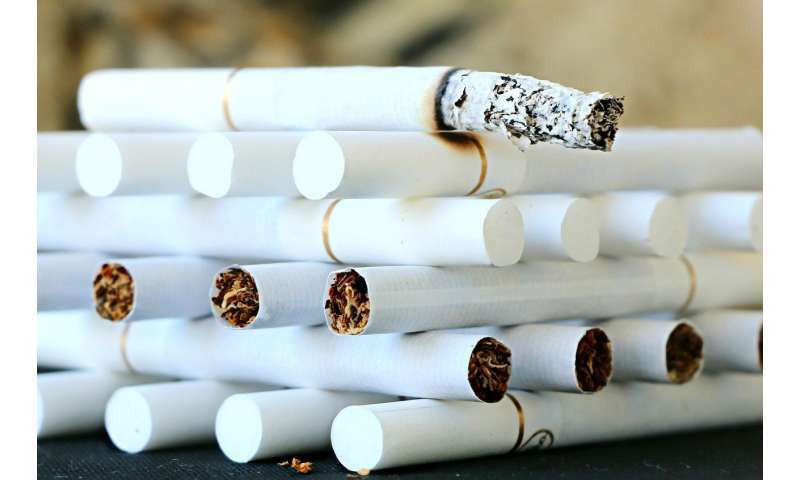 The first study to systematically identify and review literature that assesses industry-funded data on the illicit tobacco trade, it identifies widespread concerns with the quality, accuracy and transparency of tobacco-industry funded research. Industry-funded data were criticised for a fundamental lack of transparency at every stage of the research process, from sampling and data collection, through analysis to publication of findings. The authors posit that the consistency with which issues have been identified suggests that the tobacco industry may be intentionally producing misleading data on the topic. The authors suggest that despite overwhelming evidence of historical complicity in tobacco smuggling and their latest evidence suggesting that tobacco companies are continuing to fuel the illicit trade, the industry now portrays itself as key to solving the problem, presenting its funding of research as an example of its attempts to reduce illicit trade. Lead author Allen Gallagher from the Tobacco Control Research Group at Bath explains: "Our latest findings fit with the tobacco industry's long history of manipulating research, including its extensive efforts to undermine and cause confusion on science showing the negative health impacts of smoking and second-hand smoke." Second author Dr. Karen Evans-Reeves added: "Despite far-reaching concerns over industry-funded data on this topic, tobacco companies continue to spend millions of pounds funding research into the illicit tobacco trade. As recently as 2016 Philip Morris International's PMI IMPACT initiative pledged 100 million USD for this purpose. Yet, if industry-funded data consistently fails to reach the expected standards of replicable academic research, we must question if it has any use beyond helping the industry muddy the waters on an important public health issue." The team is now calling on governments and international bodies to crack down on Big Tobacco's tactics, to ensure that systems designed to control tobacco smuggling are truly independent of the industry and its front organisations, and that research on tobacco smuggling is free of industry interests. Professor Gilmore, senior author on both papers states: "Governments, tax and customs authorities around the world appear to have been hoodwinked by industry data and tactics. It is vital that they wake up and realise how much is at stake. Tobacco industry funded research cannot be trusted. No government should implement a track and trace system linked in any shape or form to the tobacco manufacturers. Doing so could allow the tobacco industry's involvement in smuggling to continue with impunity." Andy Rowell, co-author of the first paper states: "Governments need to be alert to what the tobacco industry is doing and to realise it is now operating via a complex web of front groups and companies. Any track and trace system linked to 'Codentify' simply cannot be trusted." In the first years of the century tobacco companies were fined billions of dollars for cigarette smuggling within Europe. No one higher in the hierarchy than truck drivers went to jail though, and the amounts of the fines were in almost all cases less than the taxes they would have paid had they shipped the cigarettes legally. Where is the incentive to stop? Cusco, in many countries, especially the U.S., tobacco companies make huge donations to politicians campaigns both directly and through PACs. There is nothing more important to a politician than getting elected except getting re-elected and the tobacco companies help fund this. In that sense, the tobacco companies OWN the politicians. In the end, its all about money. If this happens with tobacco. Makes you wonder who sponsors the illicit drug trade. Takes a lot to organize the manufacture and world distribution of drugs. It takes people in high places for that to happen. Thugs do not have the capacity. There just like the tobaccos truck drivers. Well, we all know who enables it, over a Trillion (yes, with a T) dollars is laundered through the US banking system every year, we are the planet's largest money laundry. It's so lucrative that the CEO of the New York Stock Exchange went to do a sales call on the FARC in the jungles of Colombia (as reported in the Wall Street Journal), and then retired with the richest compensation package in the history of that organization. It's so lucrative that a US Treasury Secretary left "public service" to go run CitiCorp's money laundering, err, I mean "private banking", division where he organized their purchase of Banamex the "drug smuggler's bank of choice" with its valuable customer list. Why is this a tobacco industry scam? It's governments that make smuggling illegal and profitable. Put the blame where it belongs. Corporate executives decide to break the law and cheat the public out of billions of dollars and somehow that's government's fault? You must be a Libertardian with logic like that. You should really change you name to "ForClosedMinds"